I’ve had this recipe floating around in my head for eons, or weeks any way, and I just hadn’t had time to make it. Well I’ve finally been able to get to it, and it’s in perfect timing for Thanksgiving, and it just so happens that this dish is perfect to serve for Thanksgiving! 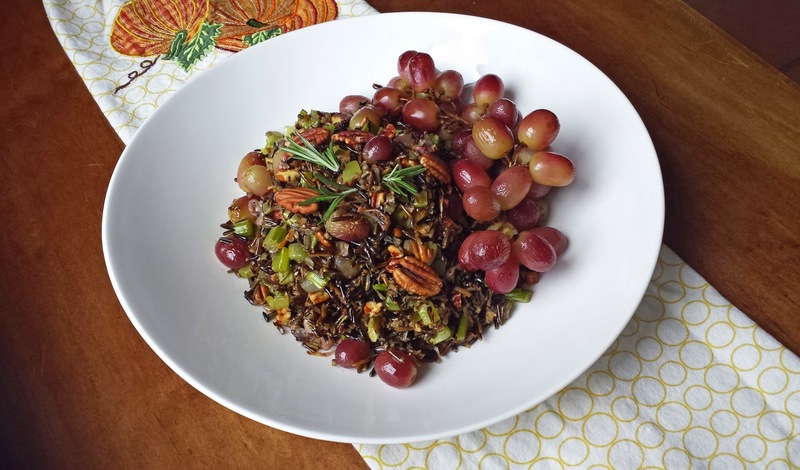 Now really Wild Rice & Roasted Grapes can be eaten at any time of year, and the flavors are perfectly suited to pairing with pork, chicken, rabbit, or even stuffing into Cornish game hens…and of course it goes great with turkey, and all the fixins. It’s really simple to make this dish, but it looks so festive with those pretty roasted grapes that it feels like it should be a special occasion dish! Roasting the grapes intensifies the sweetness and the grape flavor becomes more complex. Celery tastes mildly of licorice and keeps things interesting; pecans add texture, and rosemary makes it savory. This dish is as much about what’s goes into the wild rice as the wild rice itself, it’s pretty much half wild rice and half everything else. That’s how I like it, but if you’d like it to be more about the wild rice, then either prepare extra wild rice (maybe a half cup uncooked) or scale back on the other ingredients. Roasted grapes are kinda froufrou, but we all need a little froufrou once in a while to keep us civilized! And here’s to a civilized Thanksgiving! 2. In a 3 quart sauce pan combine the vegetable or chicken stock and water, bring that to a boil. Add the salt, bay leaves and wild rice; bring the liquid back up to a boil, and then cover the pan and reduce the heat to low. Cook the wild rice for about 45 minutes, or until the rice is tender. Drain the rice and season with salt & pepper if necessary. 3. Meanwhile, toss the celery, loose grapes, shallots, rosemary, 3 Tbsp. olive oil, salt and pepper together and lay it all in a single layer on a small sheet pan (you may do this right on the sheet pan). If you’ve got the bunch for garnish as well, just make a spot for them in one corner of the pan, and drizzle them with just a touch of olive oil, roast in the hot oven for 25 to 30 minutes, until the skins of the grapes begin to burst. 4. Also, lightly toast the pecans by either putting them in a dry baking dish, and roasting for 8 to 10 minutes, or in a put them in a cool, dry skillet and cook over medium heat, stirring every once and a while, for about 8 minutes, until you can smell the nuttiness of the pecans. 5. Gently stir the roasted grape mixture as well as any liquid that may be on the sheet pan, and the pecans into the wild rice. Pour onto a platter or bowl, and garnish with the bunch of roasted grapes. Serve warm or at room temperature. 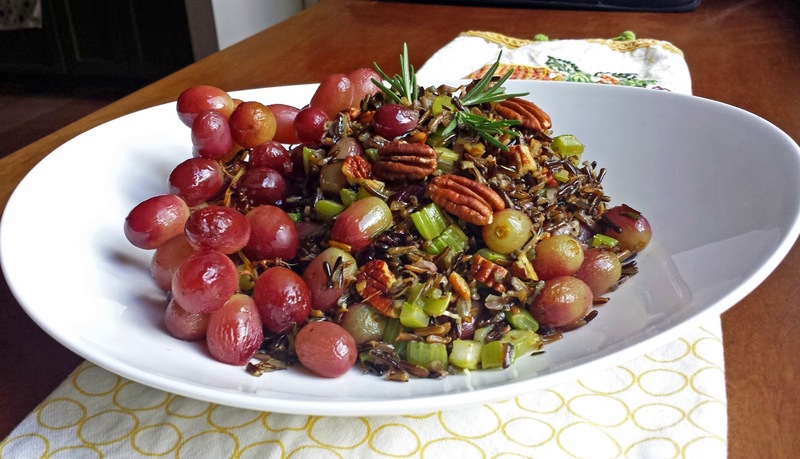 Note: Wild Rice & Roasted Grapes may be made a couple of days in advance and then brought up to room temperature to serve at room temperature, or to re-heat in a covered baking dish at 350 degrees for about 25 minutes, until the rice and the grapes are hot. Gooooorgeous! 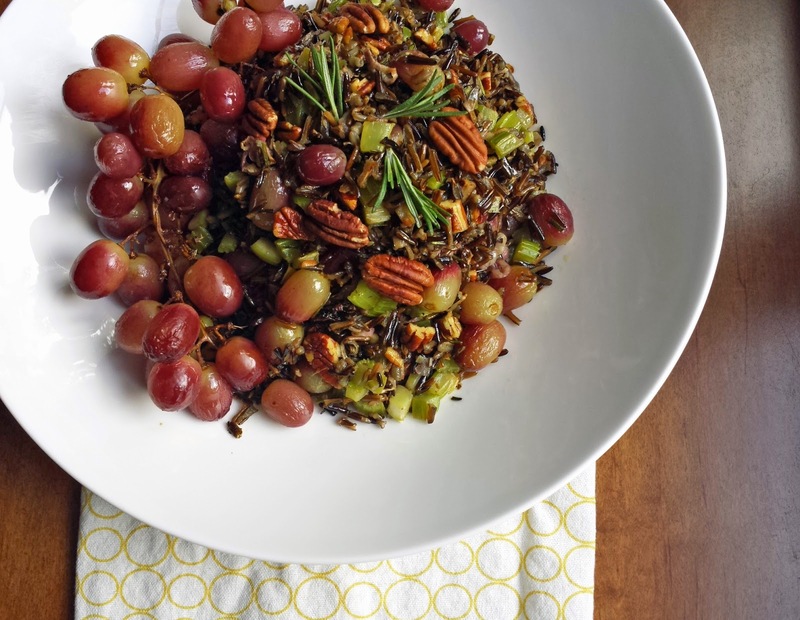 I love roasted grapes and I imagine this rice is so full of flavor and texture! My family would go nuts over this for Thanksgiving! Oh Kari - this recipe speaks to me - actually it's yelling my name! Thank you. 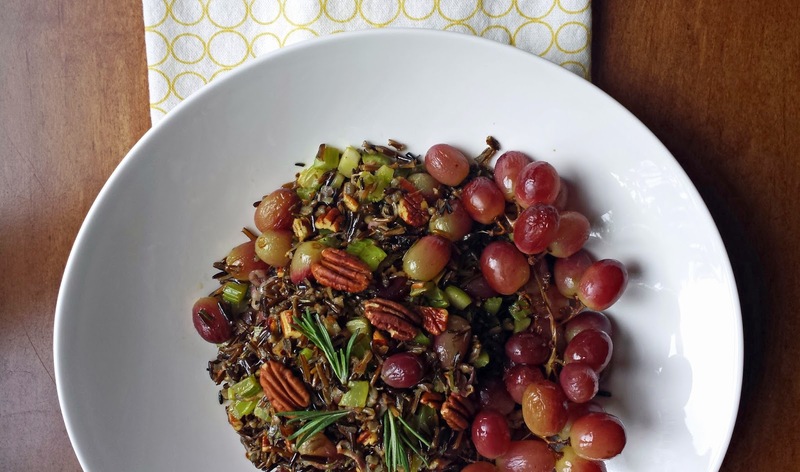 We love wild rice and I've always wanted to try roasted grapes. Bravo!! Hope you have a wonderful Thanksgiving! You really should try roasted grapes Tricia, they're de-lish! This is a delicious dish. I love all the flavors with the roasted grapes. Thanks so much for sharing with Foodie Friends Friday party this weekend. Will be pinning/sharing over the weekend. Thanks for having me at Foodie Friends Friday! I truly appreciate your sharing.